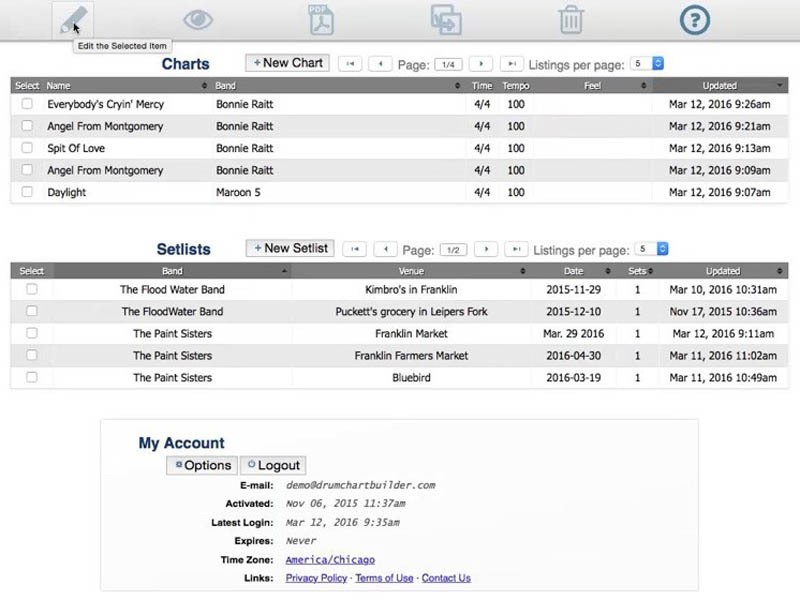 Organize your repertoire of charts, and see all of your setlists in the Manager — edit, view, create PDFs, duplicate and delete, all from one place. 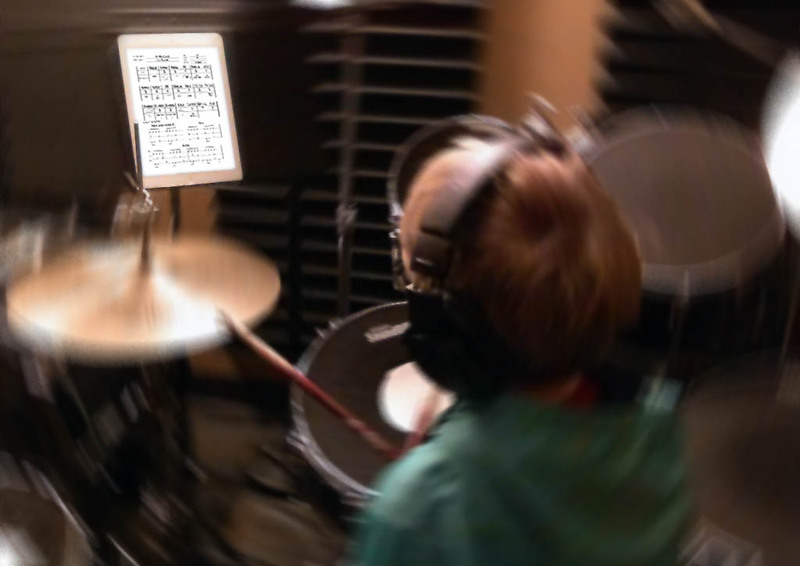 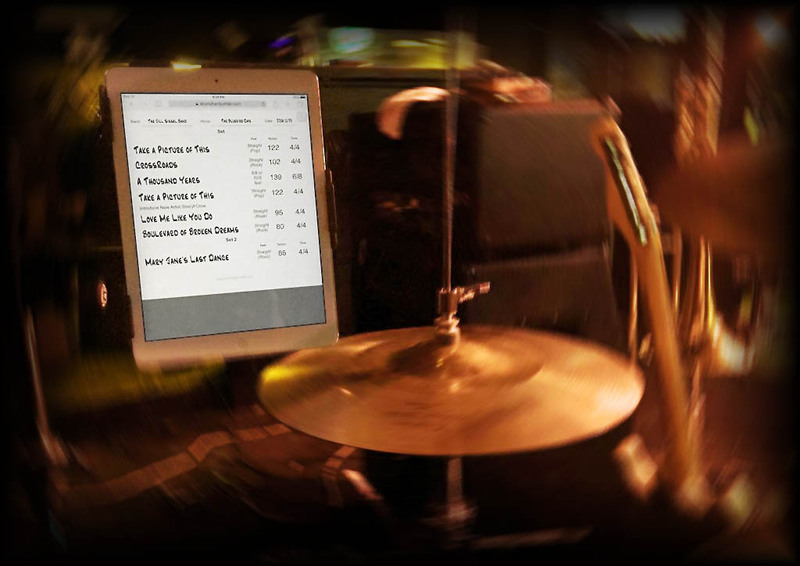 Insert song form descriptions, bar numbers, and drum instructions with a single click using fast Drop-Menus. 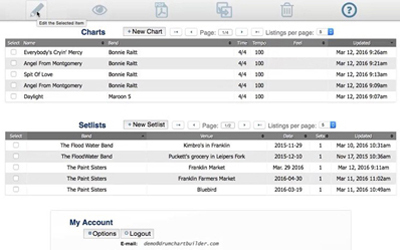 Move, copy, add or delete bars or new blocks, and re-arrange your charts. 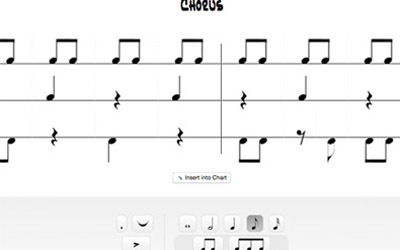 And just click in the chart and start typing to add your own text. 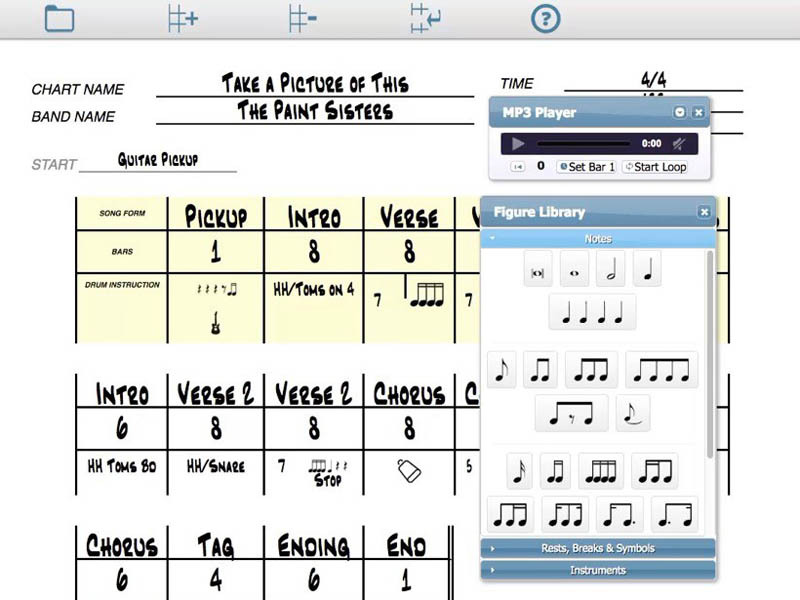 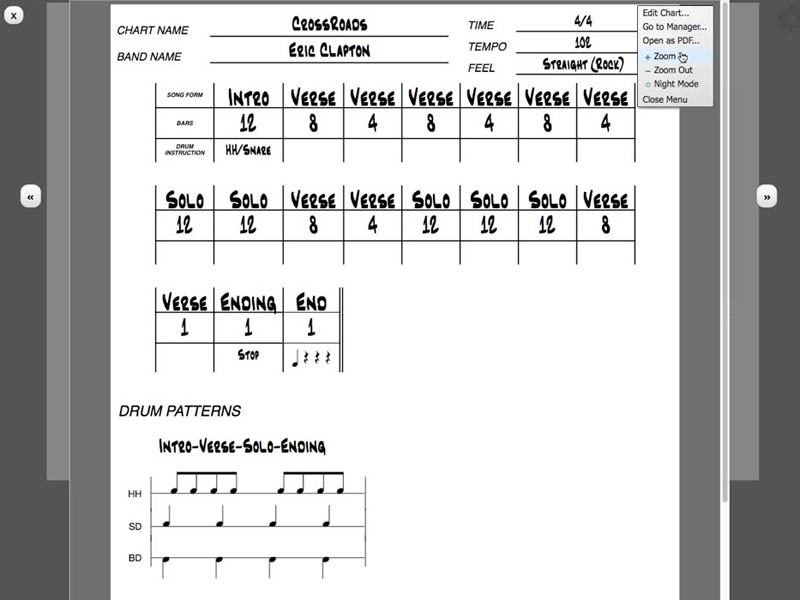 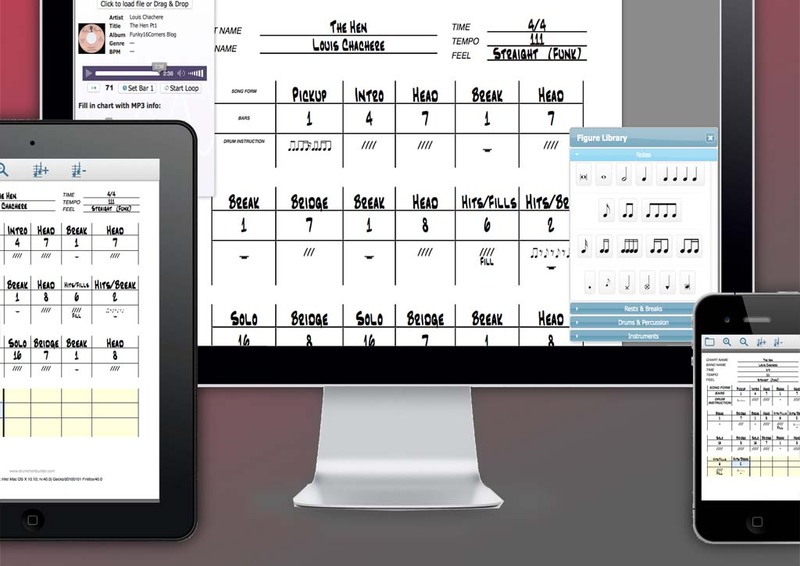 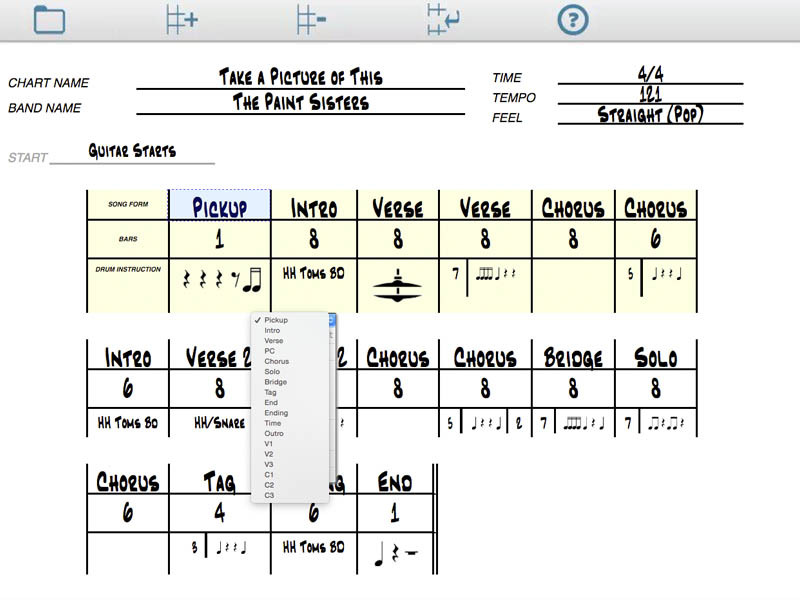 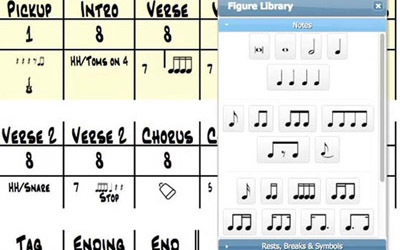 Using the Figure Library, customize charts with images — including notation, rests, percussion and other music symbols to make the chart your own. 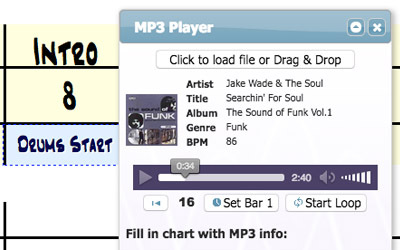 Upload an MP3 file with any chart to take advantage of advanced, time-saving features. 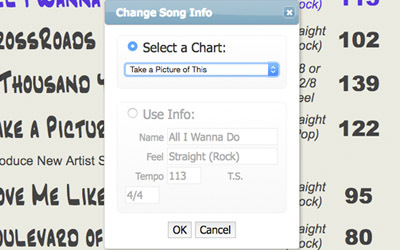 Automatically fill in the artist, title, and other chart fields with the file's ID3 tags. 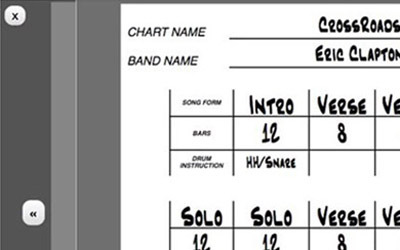 Use Auto-Count to help count bars and long song forms, and Loop to repeat sections of the song for charting or rehearsal. 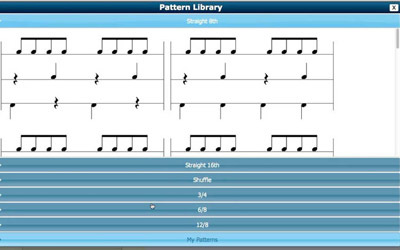 Add parts with the Pattern Library: choose from a variety of musical styles and common rhythmic feels, such as Straight 8ths, 16ths, Shuffle, or Waltz. 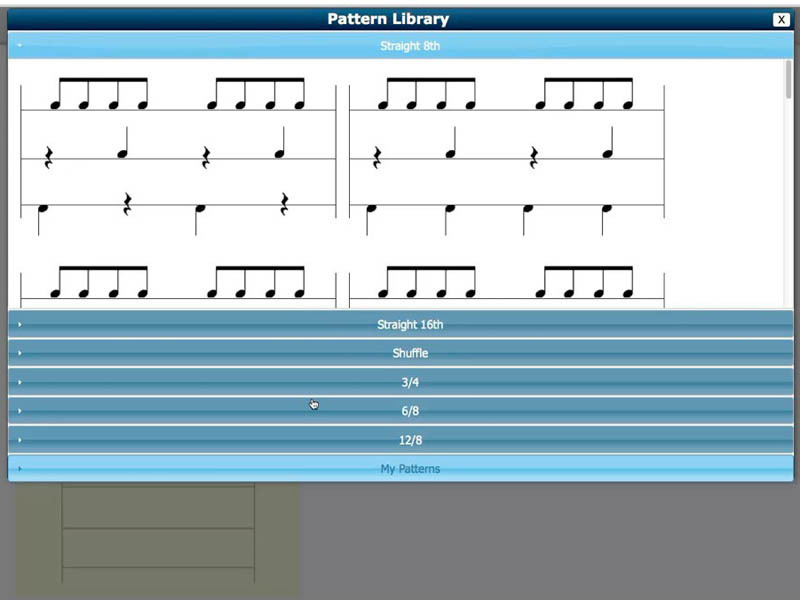 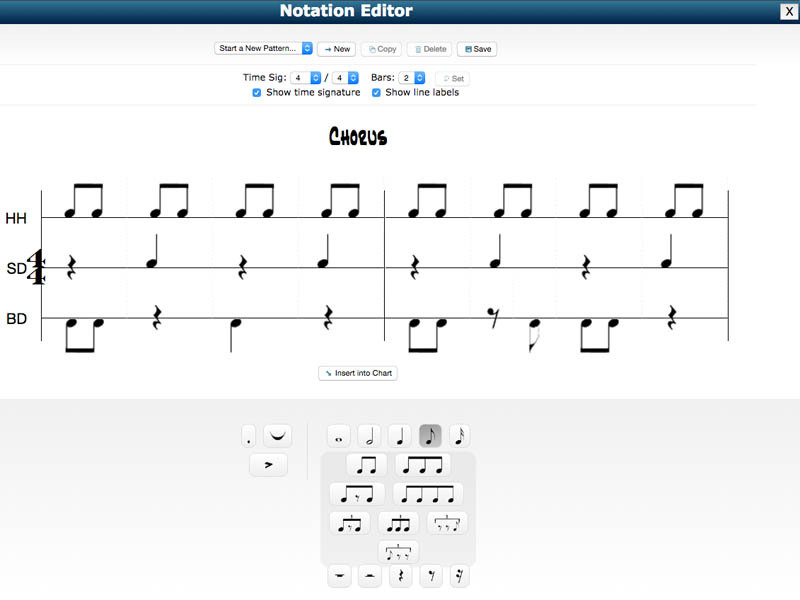 Create and customize any pattern with the Notation Editor — edit, save, and build a library of your own drum parts. 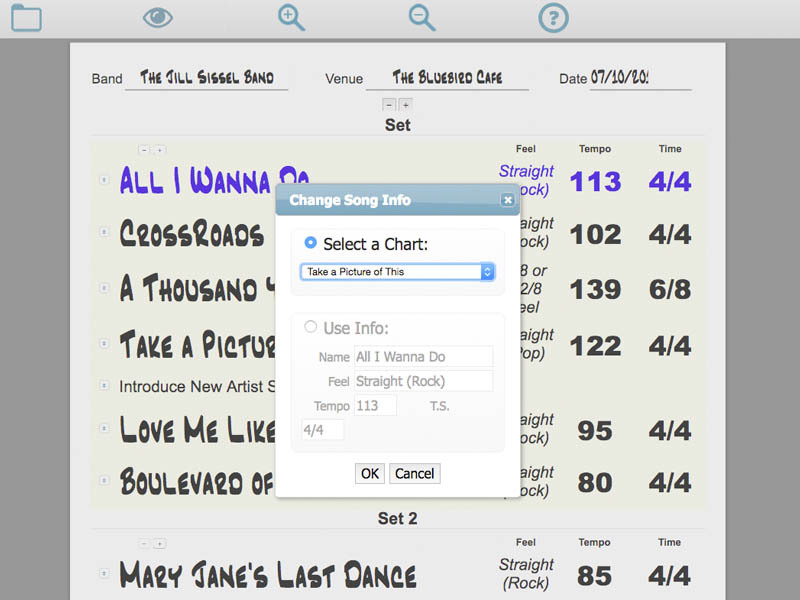 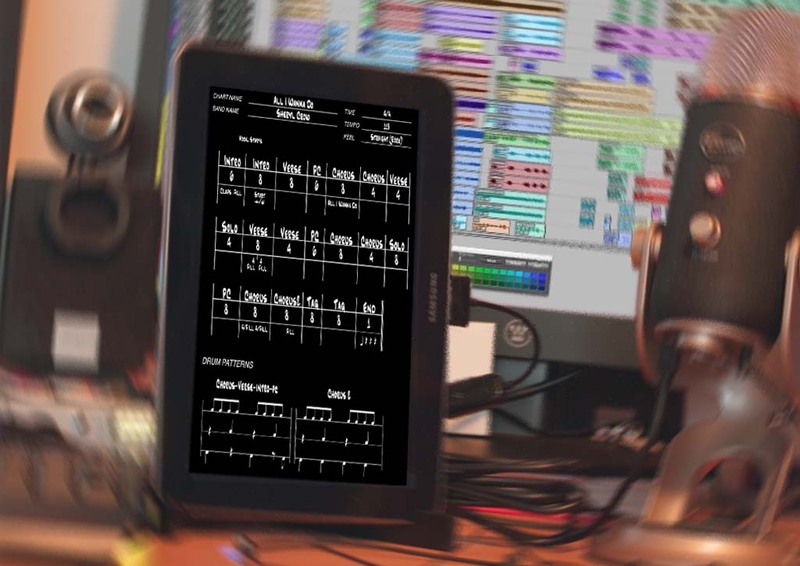 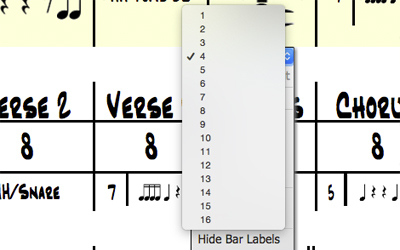 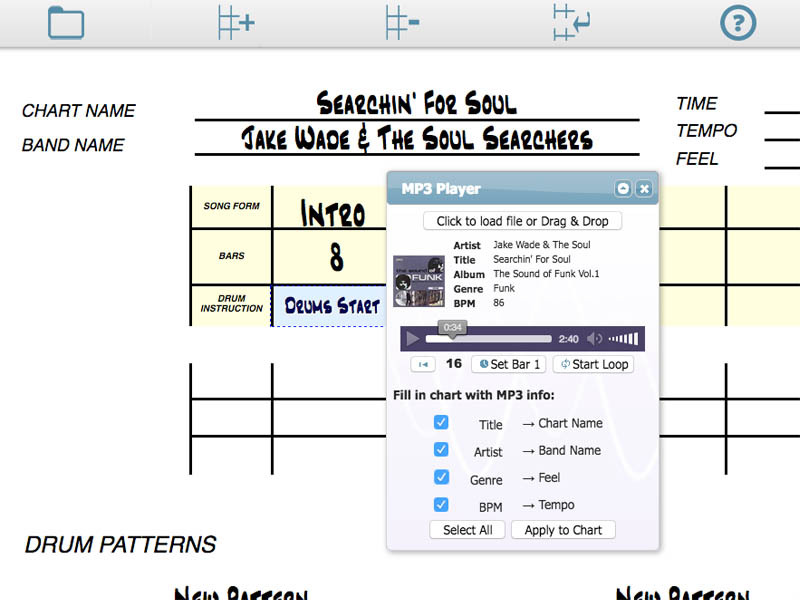 Make Setlists from your charts, and view them one-by-one with a single click. 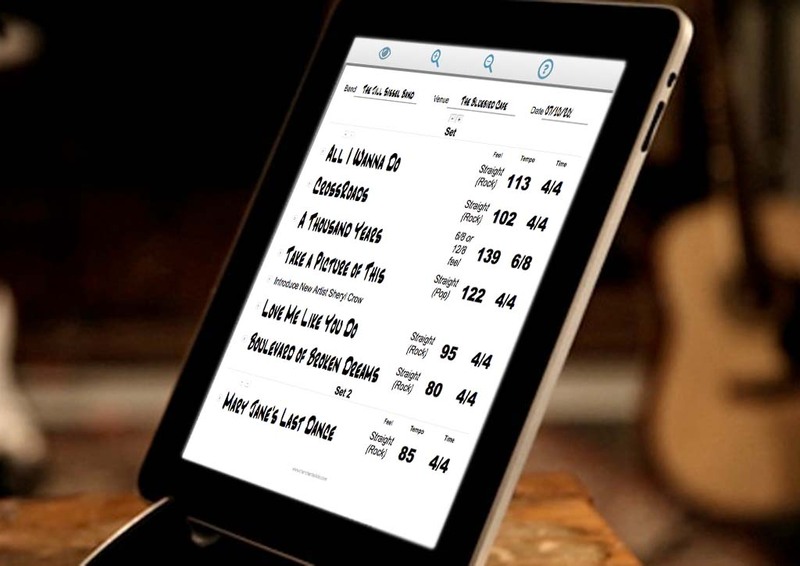 Save the setlist and all its charts to a single PDF file for easy sharing, or to grab-and-go on your mobile device.